Part one of this website's mapping of Marvel's Bronze Age of comics covered the heroes you knew from the dawning of the Marvel Age of Comics- characters who had their own titles, like Fantastic Four, Spider-Man and Hulk, or who shared their own titles with others, like Nick Fury and Ant-Man. Part Two- the page you are now looking at- charts the new titles that popped up on the landscape in the first half of the second decade of Marvel. When the 1970s began, and new creative philosophies began to emerge in the Marvel bullpen alongside the new talent being drafted to carry the reins, there was a new freedom allowed to Marvel's corporate possibilities. Finally, Marvel was allowed to publish more books than ever before, and there would need to be new characters created and new comic concepts to create to keep fan interest high! 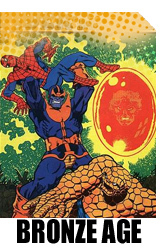 Two major titles featured Spider-Man and the Thing, both starring in new team-up books called Marvel Team-Up and Marvel Two-In-One, in which they were matched up with an unending cast of their fellow Marvel Universe super-heroes. And Marvel created a niche for a new kind of monster comics, with the loosening of some code restrictions, drafting in old stalwarts like Dracula, Frankenstein and the Werewolf (by Night, natch!) to stand next to company-created ghouls like Ghost Rider, Morbius, and Man-Thing! A new super-team was started to stand next to the Avengers, and it was as off-beat a team concept as you could find: The Defenders, a team of heavy-hitters and also-rans who had little to no reason to be together, but got together anyway! And speaking of off-beat, who can forget perhaps the oddest "super-hero" of them all, Howard the Duck? Brought to the public's attention in an issue of Fear, starring Man-Thing, the irascible duck was actually a bona fide critical hit for most of his comics run. The first half of the 1970s was a weird and wacky time for Marvel. There's so much material here that should appeal to many different tastes, and when and if Marvel Masterworks catches up to this period, we'll surely have to wonder what they'll want to choose from- there's really quite a lot that's worthy of entering the Masterworks canon. But for now, we can only ask...."What If?"